I really appreciate reading about options and choices when it comes to organizing. I tend to feel a little suspicious when I read that a specific way of organizing or a specific organizing tool is necessary. Vicki, I understand your concern. While there are some general principles that apply to most organizing situations (such as keeping similar items together), there are also many specific products and techniques for addressing almost any organizing challenge. The trick is to find the solutions that work best for you. The following are some of the choices you have when it comes to organizing papers. While this isn’t a complete list — that would take more space than I have here — it should give you an idea of just how many options you have. If you’re going to keep a large number of reference papers, you’ll need to decide how to file them. The most common choices are binders and file folders. You might want to use binders for certain types of papers and file folders for the rest. Your decision might be driven by the kind of space you have available: file cabinet space or bookshelf space. Or your choice might be based on the type of papers you have and how you use them. I’ve found binders work well when I have a large number of papers I want to quickly grab and take with me to a meeting or event. They also work well for information you want to share with others, such as a babysitter. Ease of use is a big factor, too. Which tool would make you most likely to keep up with your filing? If you’re using binders, do you want to put papers into sheet protectors or would you rather hole-punch them? Alternatively, would you prefer a tool such as the Itoya Profolio, which has built-in sleeves for papers, but doesn’t have a way to move the pages around? It’s lighter weight and less bulky without the ring mechanism, but it’s also less flexible. If you’re using folders, you may prefer to use a ready-made filing system, such as FreedomFiler. Or you may prefer to create your own files. If you’re creating your own files, you have some choices to make. Do you want to use standard file folders, hanging file folders, or hanging folders combined with interior folders? The plastic tabs on hanging file folders annoy some people, but there are options such as Smead’s hanging files with built-in tabs. Again, you can use a combination of techniques. For example, I usually go with just a hanging file, but my client files are standard file folders kept inside box-bottom hanging files. Another folder decision is whether or not to use color-coding. Having certain types of files in certain colors can provide a useful visual cue (and help you find a misplaced file), but this approach also means you need to ensure you never run out of the colors you are using. It’s a bit of complexity that will help some people and hinder others. In some cases, you may not need either file folders or binders for your papers. You could use the approach suggested by LJ Earnest, where you put all financial and tax-related papers for a year in a single box, with no folders. Action files are those related to things you’re going to do in the near future. Papers filed here could include bills to pay, election materials to read through and a ballot to complete, birthday cards to mail, dry cleaning receipts for things you need to pick up, the scribbled notes about a call you need to return, etc. If it helps you to have these files out in front of you, rather than buried in a file cabinet drawer, the most common tools are an incline file sorter (also called a step file) and a desktop file box. The desktop file is more transportable, if that’s a concern, but files aren’t quite as visible. Another tool you may want to use is a tickler file: 43 folders (or sections in an expanding desk file) where you file papers by the date (in the current month) or month (for upcoming months) when you want to deal with them. There are certainly other choices, too. For example, you might want a series of clipboards mounted on the wall, mailing envelopes on the back of a door, labeled baskets on a shelf, or hang-up bags on a desktop or wall-mounted rack. We all have snippets of good memories from our youth that occasionally bubble up and bring smiles to our faces. While watching some of the World Series the other night, I had a flash of memories from being a kid and getting ready for bed while listening to Kansas City Royals games on the AM radio. The pops and and crinkles of the AM broadcast mixed with the sound of the ball making contact with the bat were front and center in my mind and I’m pretty sure I smiled the entire next day. I’ve since been listening to the games on the radio instead of watching them on tv because it makes me so incredibly happy. Don’t get me wrong, I LOVE a good Hawaiian shave ice (especially the root beer float ones with a scoop of vanilla ice cream at the bottom of the cup and root beer float syrup over the ice). But, like any treat, it’s not something you want every day. Once, maybe twice a year at a festival does the job and feeds the nostalgic happy memory. These two unitaskers take up a huge amount of space and, if you live in a four-season part of the world, you’re likely not interested in using them for 3/4 of the year. 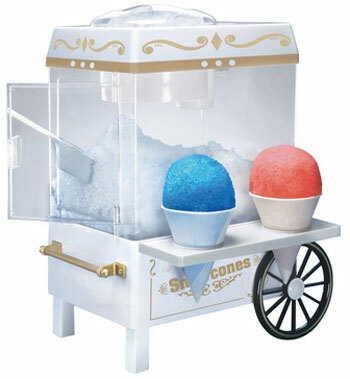 They also don’t make anything other than snow cones. 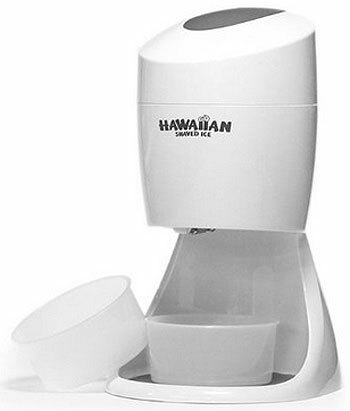 And, since in a pinch you can always put some ice in a zip-top bag and whack at it with a meat tenderizer hammer for a few minutes, you don’t really need a special machine to make a snow cone at home if you have the rare craving. Are these fun? Sure. Are they unitaskers? You betcha. We’ll stick to getting our treats of nostalgia at summer festivals. Kindle MatchBook lets you upgrade your previous Amazon.com print-edition book purchases for select titles to the corresponding ebook versions. I think that this week’s unitasker may actually be a non-tasker. Ever since reader Penni sent this Egg Cuber to me, I have tried to imagine why someone would want square eggs — and I have yet to come up with a reason. I’m lucky enough to be able to work from home. Despite the battles with distraction, it’s a real luxury that I definitely appreciate. I’d wager that those of you who don’t complete your 9–5 at home still have a home office, computer room, command center, or some such other space that you use to attend to professional and personal management tasks. Although these home work spaces are helpful, it’s inevitable you’ll be ejected from it at some point. Flaky internet, construction right outside your window, your kid who needs to do research for a school project, your neighbor’s dog that just won’t stop barking … these factors can make your sacred space less than amenable to productivity. Fear not! There are many public options available, and early organization and preparation will make it easy to head out the door and get back to work. The following are insights into how I’ve organized a mini, portable office. First, identify the equipment you’ll need, and then whittle the list down to the most essential. For example, I’d love to bring my laptop, folding stand, Bluetooth keyboard, and Bluetooth mouse to an off-site work session, but all I need to work is the laptop. Sure the trackpad stinks, but not as badly as hauling all of that stuff around. The idea here is to travel light. I also bring a notebook and a pen, both small. I know myself well enough at this point to understand that I like to scribble and doodle random thoughts and tasks during my work day. Lastly, I grab a charger for the laptop and a charging cable for my iPhone. I put the lot into a bag and I’m good to go as soon as the jackhammer starts pounding out my window. In addition to the items listed above, these next few items really make it a killer setup. Consider putting these things into your own bag to reach the next level of mobile office work. A little cash. Many people use a coffee shop or cafe as a backup office. Most proprietors welcome laptop warriors, as long as they buy some things in their shop. Save yourself a trip to the ATM by popping $5 or $10 in your bag now. Yes, the cafe likely accepts debit cards, but cash makes it easier to tip the staff. As a camper, you want to stay on everyone’s good side. A power strip. These are bulky, but hear me out on my justification for packing one. I like to work from my local library. It has free WiFi, huge tables, and very few power outlets. When I approach a crowded table and plug a six-socket power strip into the wall, I become The Hero of the Library. Try it yourself and bask in the glory of your appreciative peers. An extra AC adapter for your laptop. This one is a bit pricey but it’s worth it. The adapter I plug my laptop into at home is entwined in an under-desk cord manager and getting it out is a pain. Keeping one in the bag saves time and aggravation. A charging cable for your phone. You don’t want your phone to die, and you can’t always predict when you’ll be out or for how long. I don’t pack a wall adapter for my phone, as I’ll just connect it to my laptop which has its own USB adapter. A pair of headphones. This super useful item is the universal signal for, “Leave me alone, I’m busy.” You needn’t even listen to music if you don’t want to (unless the cafe’s radio station is especially awful). I recommend packing this stuff into a bag right away and just letting it sit. When it’s time to go, prep time will be minimal and you’ll be on the road to productivity (and maybe a latte) in no time. When uncluttering, it’s quite easy to make decisions on items for which we have no feelings or emotional attachment. But when we have feelings associated with physical items, it can be hard for our heart to let them go even though our lack of usable living space tells us we really need to say goodbye. These are some of the most difficult items to deal with because the object reminds us of the person or event, so we keep the item to trigger memories. A short-term emergency measure of dealing with sentimental items is to box them up and store them. This is ideal if there is a sudden death or downsizing in the family. You must, however, eventually deal with these items because they will eventually fill your storage area and will deteriorate if stored indefinitely. Sorting and organizing sentimental clutter can be very emotional, so only do a little at a time. Finding a friend or family member to help you sort can be beneficial. Make sure you choose someone who is willing to listen to some stories behind the items. This person should also know whether you need a shoulder to cry on or a kick in the pants when it is time to say good-bye to the sentimental clutter. If you had to purchase the item yourself, at full price, would you? If someone you didn’t like gave you the item as a gift, would you still keep it? Does the item invoke happy memories? Take photos and write stories to capture an item’s significance in your life. You can even tell the story on video and share it with your family. Your children can do this with some of their school projects. Essays, reports and drawings can be scanned and saved in digital format. This will prevent them from getting lost or broken over the years (especially during household moves). Make and display photomontages of your vacations instead of keeping souvenirs. You also can set digital images of your vacations as the screen saver on your computer, if you’re short on wall space. If you’ve inherited a collection of items (pocket watches, salt and pepper shakers, etc.) keep the ones you like best and let the rest go. Offer the other items from the collection to other family members or friends of the family. This holds true for sets of dishes too. 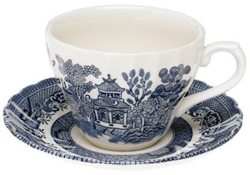 You needn’t keep the entire set of china together. For example, if you inherit grandma’s china, one grandchild could have the dessert plates, another could have the platters and another the gravy boat. Display your items so they bring you joy throughout your home. You should limit your items to one or two shelves and keep only items that fit on those shelves. If you can’t display your items, limit them to only one storage bin and keep only the things that fit inside that bin. Because you have a significant emotional attachment to these sentimental items, it is important to get them out of the house once you’ve made the decision to let them go. If the items are destined for charity, then take them the same day or ask a friend to take them for you (then, return the favor). If the items are to be given to other family members, box them up and tape the box closed. Make arrangements for pick-up or drop-off as soon as you can. If you’re really feeling bad about an object that is leaving your life, you can have a “funeral” for the item. It helped me out when I really needed it. Way back in 2008, we featured the dangerous Condiment Gun in our unitasker column. Little did we know at the time, but the threat of ketchup being shot at you from a .45 revolver was only the beginning of the menace. My son declared Taco Tuesday a failure because the ground beef wasn’t chopped into small enough pieces (okay, so he didn’t really say that) and that he would have continued eating his meal had I used the Chop Stir to break up the ground beef better (he didn’t say that either). Are you prepared for a disaster: an earthquake, flood, hurricane, blizzard, fire? On Unclutterer, we’ve written about emergency supplies and about preparing your tech for a weather emergency. But having just attended a workshop led by organizer Margaret Lukens, I have the following additional tips. Depending on the situation, you may need to shelter in place or you may need to evacuate. Thinking through both of these scenarios will help you be more prepared. Also, after a disaster, you’re likely to need all sorts of information in order to recover and rebuild your life. Be sure you’ll be able to provide the name of your insurance carrier (and preferably the policy number) as well as key financial and medical information when necessary. A clear understanding of your risks will help you prepare wisely. For example, while many Californians fear their houses may collapse in an earthquake, most houses are unlikely to do so. The biggest risk is a large window breaking and shattering glass everywhere. That’s why you want to keep a pair of your shoes near the bed (stored in a bag or otherwise protected from getting glass inside them). And having the tools only works if you know how to use them. Do you know how to turn off the gas (and when you should)? Do you know how to use the jumper cables you have in the car trunk? If you’re at all concerned that you might not remember in the stress of an emergency situation, you can print out the instructions and keep them where you’d use them. If you’ve bought a pre-packaged emergency preparedness kit, be sure you know when and how each item in the kit is intended to be used. Where’s the best place to store emergency supplies in your home or office? There’s no perfect answer. While places such as the front closet, the garage, the basement, or a well-secured outdoor storage container may be good under many circumstances, you can always devise a scenario under which that location won’t work. One way to work around this is to store supplies in multiple locations. Or you can simply assume the most likely scenarios. For example, since most freestanding houses in California (with a few notable exceptions) aren’t likely to collapse, supplies stored in the house are likely to be accessible. Having all the supplies and services you might possibly need for any type of emergency can sound daunting. But, if you pool together everything your neighborhood has, you may find that you’re more prepared than you realized. Someone may have the medical knowledge to deal with a broken arm temporarily, if getting hospital care is problematic. Someone else may have the tools needed to deal with after-disaster cleanup. It’s also good to know which of your neighbors may need extra help in a disaster situation: people with medical issues, people who don’t speak English and therefore may not understand announcements, etc. Most multi-tasking or high-utility kitchen products have simple names that begin with lowercase letters: skillet, oven, knife, plate. A good sign that something might be a unitasker is when its name is cutesy and trademarked: JerkyXpress, Plater Grater, Nostalgia Cotton Candy Maker. By all accounts, the Chef’n Garlic Zoom is destined for unitasker greatness based on the fact that it includes a random apostrophe and the word zoom. There are a lot of things I like to do in this world, but running a meeting isn’t one of them. Years ago, I had a boss who would call me into his office and talk for a good half hour. As I walked back to my desk, I’d think, “So, what just happened in there?” Now, when I’m in charge of a meeting, I worry: will my attendees walk away with a clear idea of what was said and what, if anything, needs to be done? I recently found myself in the unenviable position of sitting at the head of the table, as it were, but not until I had done some research on effective ways to run a meeting. There are a lot of articles out there on the topic, and here I’ve collected the best advice I could find. Now, please come to order and review these tips for running an effective meeting. WikiHow provided advice that I’ve been advocating for a long time. Partly because of my admitted meeting anxiety, and partly because I really don’t like wasting time. Specifically, determine if a face-to-face meeting is really necessary at all. There are instances when you simply must sit down in the same room to have a conversation or spark collaboration. But, if the agenda is something that can be accomplished with an email thread or a quick conference call, do that instead. You’ll save everyone a lot of time. They also suggest distributing the meeting’s clear goals in advance. I’ll admit that I’ve never done this. Instead, I hand out a paper agenda as people are sitting down to the table. This throwback behavior from the ’80s is distracting, as everyone sits and reads the paper or thinks ahead to the topic they’re most or least interested in. From now on, I’ll distribute the agenda a day or two ahead of time, so people can show up ready to go. I used a similar trick on myself when I was in college, after learning about Parkinson’s Law, which states: Work expands so as to fill the time available for its completion. If a professor told me I had 3 weeks to complete an assignment, I’d tell myself I had two. Otherwise, I knew I’d be at my desk working feverishly on day 20. Inc. has advice that addresses types of meetings. One type, the Action Meeting, is the format I’m probably most familiar with. The goal is to devise and implement a solution to a pressing problem or outstanding project. One trick I learned from David Allen’s book Getting Things Done is to end each of this type of meeting by saying, “OK, so my next actions are …” Stating this out loud confirms that you are clear on your assignment(s), and that your bosses are clear on that fact, too. Inc. also emphasizes the importance of keeping in touch after the meeting has ended. This is an area that I’ve struggled with in the past. While I’ll make a list of actions that I’ve delegated (my “Waiting For” list), I don’t always follow up with people responsible for these tasks on a regular basis. That’s something I’ll start doing. Of course, a meeting isn’t restricted to the board room. You might be on a council or committee at your kids’ school or a church. Less formally, you may even have family meetings to discuss finances or monthly schedules or vacations. These lessons may apply there, too. If you have tips for running an effective meeting, let me know. I’m always willing to improve in this area. Moving is stressful. Being organized and planning in advance can help relive that stress. If you’re moving in the near future, the following are some tips that you can do right now that will reduce the stress during the move. Buy smaller. Many of us buy the larger “club pack” or “family-size” packages in order to save a few dollars. However when it comes time to move, we may end up with only half finished bottle of ketchup or half finished bottle of bleach. If you’re moving a short distance, you may be able to transport these items yourself. If you’re moving a longer distance, keep in mind that most moving companies won’t transport perishable foods or cleaning products. Whatever items you have left may end up getting thrown out or given away to neighbours and friends. About three to six months before moving, think about buying smaller size packages to ensure that you’ll have used up the products by moving day. Watch your mail. Make a list of all the mail you receive. Unsubscribe from magazines and catalogues you no longer wish to receive. Record subscription numbers of magazines you want to receive in a designated paper file or on a computer spreadsheet. If you donate to charities, make sure they have your new address so that you will receive your income tax receipts for next year. Pitch the paper. The heaviest thing to move in your house might not be your piano or your fitness equipment — it might be your paper. From stuffed filing cabinets to shelves full of books, there is a lot of paper in your home. Shred documents you are no longer required to keep. Donate gently used books. Neither a borrower nor a lender be. Although it is fine to borrow items and loan them out, now is the time to return anything you’ve borrowed and reclaim the things you’ve loaned. It may take some time to track down everyone and everything, so start as soon as you can. Ensure your children have returned items to their friends and have collected items they’ve loaned out, too. Collect contact information. Ensure you have the contact information (address, phone numbers) of medical, dental, and health service centres (physiotherapist, etc.) you’ve visited. You’ll need this information to have your records transferred to your new health service centres. Take a business card from the clinic and write down their hours on the back of the card. When you go to the new medical clinic you can take the business card from your previous clinic, so it will be easier to have the records transferred. Avery business card pages help keep the business cards organized. Start your home sale preparations. If you’re selling your home, consider having your home inspected. An inspector will tell you all of the things you need to get repaired or updated prior to putting your home on the market. You may want also want to consult a home stager. Home stagers will give you advice on choosing paint colours and accessorizing your home to make it more attractive to buyers. By booking in advance, you’ll give yourself time to re-paint and do all the little necessary touch ups. It will give you the chance to spread the cost over several months, too. Another very odd, yet specific, food storage container! Although this week’s unitasker selection is called a Pepper Prepper — which conjures up images of a sweet pepper with a sweater tied around its shoulders heading off to Phillips Academy — I’m renaming it the Pepper Screw. It’s like a corkscrew, but it’s just for removing the tops and bellies of sweet peppers. My friend’s son recently asked her what games she liked to play on her phone when she was a kid. Had my friend owned this unitasker, her son would have known how dumb our phones used to be! C. G. P. Grey said in one of his podcasts that he shreds all papers he’s decided not to keep. This saves him sorting through papers and deciding which ones need to be shredded and which ones don’t. We know people hit “decision fatigue,” so there’s definitely some logic to avoiding unnecessary decision-making and saving one’s mental energy for where it’s really needed. I used to be intrigued by all the fancy apps for creating and managing to-do lists, and those apps certainly make sense for some people. But at some point, I realized that for me a simple text file was sufficient, and going back to that basic tool made my life easier. Sometimes extra features are a distraction, not a benefit. Label makers provide another example of a tool that might be overly complicated for you. I happen to like using one, but two of my fellow professional organizers recently explained why they don’t use label makers. If handwritten labels meet your needs, go for it! They’re certainly simpler to create. Many files are easy to sort and name. Most people don’t struggle with how to file financial or medical information, for example. Once we create these simple but less conventional types of files, many filing dilemmas disappear. It can be easy to get caught up in trying to find the perfect new homes for things we’re getting rid of, and sometimes (especially for sentimental things) that can be worth the time and effort. But other times the easiest answer is the best. I have a large serving platter that was a gift; it’s something I don’t need or particularly like, so I know I want to get rid of it. (I also know it isn’t valuable enough to be worth my time to sell it.) I enjoy giving things away on freecycle, since I’m part of a great freecycle community, but I didn’t have any luck when I tried to freecycle the platter months ago. I was about to try again, but then I realized it would be simpler to just take it to the nonprofit thrift store that’s five minutes from my home. It’s going there tomorrow.